Parker: Slayground is the 4th graphic novel that Darwyn Cooke has adapted from Parker universe. The hardcover book is published by IDW with beautiful art and cover design. For the uninitiated, the original book series revolved around Parker, a master thief and his exploits. It’s created by Richard Stark (pseudonym of author Donald Westlake) and this crime fiction series has won him critical acclaim. Cooke is a multi-award Eisner winner and in between his foray into comics, he was working as a storyboard artist for shows like the acclaimed Batman: The Animated Series by Bruce Timm. Cooke has a terrific way of creating comic panels and each scene flows effortlessly to the next with great cinematic-like sequences. One could imagine this to be the storyboard for the animation at times. It’s sequential storytelling at its best. Cooke’s retro art style is an eye-catcher for those who have not seen his work before. The use of just 3 basic colors -- blue, white and black for the book makes a great noir-like atmosphere for this classy graphic novel. Slayground is a much shorter graphic novel than the previous 3 installments. It contains the main story - Slayground and a much shorter story The 7enth. 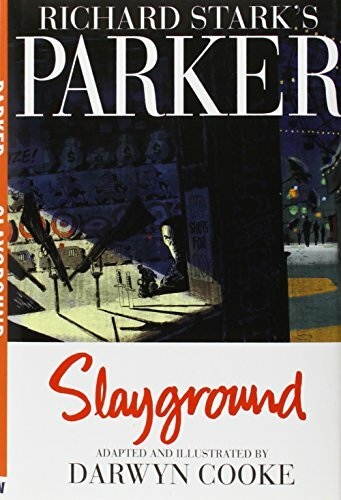 For Slayground, Parker is trapped inside an unused amusement park and it’s just him versus a gang of unsavory characters who’s out to get him and the heist money. It’s a classic cat-and-mouse story. I liked how some of the pages are “silent” and just letting each sequence and action tells the story, for example when Parker is rigging the entire amusement park before his enemies arrive. There’s also a neat feature of the fold-out amusement park and the various sites. This 4th book is a good add-on to the collection if you are a Parker/Cooke’s fan. And if you are new to Cooke’s work, you should check out the first book in the series to get acquainted with this timeless character. Another of Darwyn Cooke’s art book that is worth checking out is Retroactive:Darwyn Cooke 1998-2008.